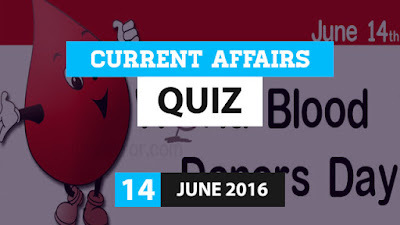 Hi Aspirants, here is the Current Affairs Quiz for 14 June 2016. This questions will be very useful for all upcoming exams. 1. World Blood Donor Day is observed on? 2. India and Ghana have recently (June 2016) signed three bilateral agreements to strengthen co-operation in varied fields. Name the capital of Ghana? 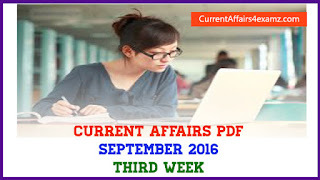 3. Who of the following assumed charge as the Chief Justice of the Manipur High Court on 13 June 2016? 4. Who has won the 2016 Canada Grand Prix title of Formula One? 5. Which entity will acquire professional social platform LinkedIn for $26.2 billion, as was announced on 13 June 2016? 6. Which among the following country is not participating in the Joint Naval Exercise Malabar 2016? 7. Name the theme of the 2016 World Blood Donors Day? 8. Writer Mudrarakshasa who died on 13 June 2016 was famous in which language? 9. Name the e-ticketing company in which Ratan Tata recently invested? 10. Name of the web portal and mobile app that will be launched by the Union Ministry of Human Resource Development for IIT JEE aspirants?